This coming week the Federal Reserve is going to conduct the Federal Open Market Committee (FOMC) meeting, its sixth of the year, over a two-day period, followed by a press conference at 2:00 PM on Wednesday September 26th. This will be the third meeting of the year with a press-conference. The other two – in March and June – resulted in Fed-Funds Rate hike of 25 basis points. The odds are very good that Fed will again raise rates next week. That will bring the Fed Funds rate to 2.0%-2.25% range. 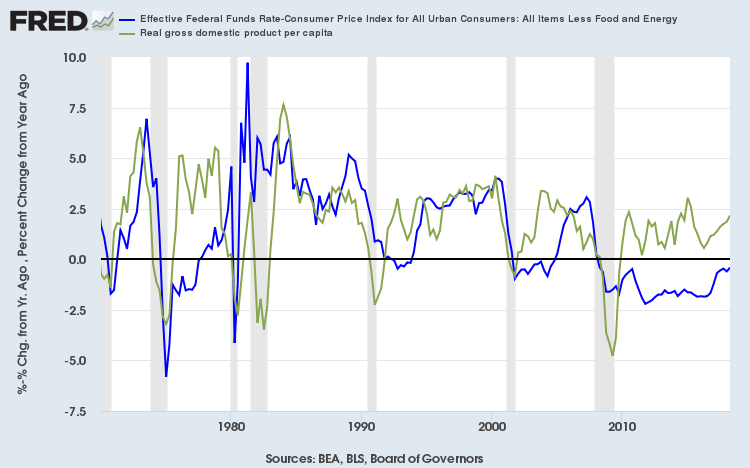 Despite having raised rates from <0.25% in December 2015 to <2.00% in June 2018 – a sequence of seven rate hikes in 30 months – the real Fed Funds rate is still negative (see Fig. 1). With another 25 basis point hike, the usual that the Fed considers in a normal rate-hike cycle – the Fed Funds rate will near breakeven level but it will still not turn positive, which effectively means that the accommodative monetary environment will continue. In its June 13, 2018 Summary Of Economic Projections, the Fed expected the Fed Funds rate to be 2,4% by the end of 2018, 3.1% by the end of 2019 and 3.4% by the end of 2020. In other words Fed expects two more rate hikes in 2018, three in 2019 and one in 2020. Off course these are projections and they usually change but, nevertheless, the market is already discounting two rate hikes in 2018 as the futures markets indicate a 90% chance of a rate hike in December 2018. However, futures market is less certain about three hikes in 2019, although it the one in March 2019 is more probable. To maintain a healthy economy the sweet spot for Fed Funds rate is between 2 and 5 percent. Tim Duy of Fed Watch, who pegs the median policy maker estimate of the neutral rate to be 2.9% within a range from 2.25% to 3.5%, says that the Fed’s monetary tightening process should be dependent upon the economic conditions. Rosengren is correct. There is far too much uncertainty about the path of the economy to assume the Fed will pause when policy rates reach estimates of neutral, particularly the lower estimates. Hence, be cautious of reading too much into claims by central bankers that they expect a pause after three or four more rate hikes. That pause is very conditional on the state of the economy after those increases. Talk of a pause is currently more about hope than reality. Incoming data remains far too strong for the Fed to contemplate an end to rate increases. Job growth continues at a rate the Fed believes will eventually be consistent with an overheated economy. And there is no reason to expect pressure on the labor market to alleviate anytime soon. Initial unemployment claims continue to trend downward while the number of job openings reached record high in July. On the other hand are Brad DeLong and Narayans Kocherlakota. Prof. DeLong thinks that it more likely than not he the Fed will be back at the zero lower bound in three years. Prof. Kocherlakota sees recession as the most important risk for U.S. economy in the next two years. We are more in the second camp – DeLong & Kocherlakota – than the first – Duy, Rosengren and Givernor Lael Brainard – and one indicator that we are keeping an eye on is the yield-curve or the 10-Year & 2-Year Treasury spread. As the spread is still above zero, we do not think that the U.S. will be going into recession anytime soon. 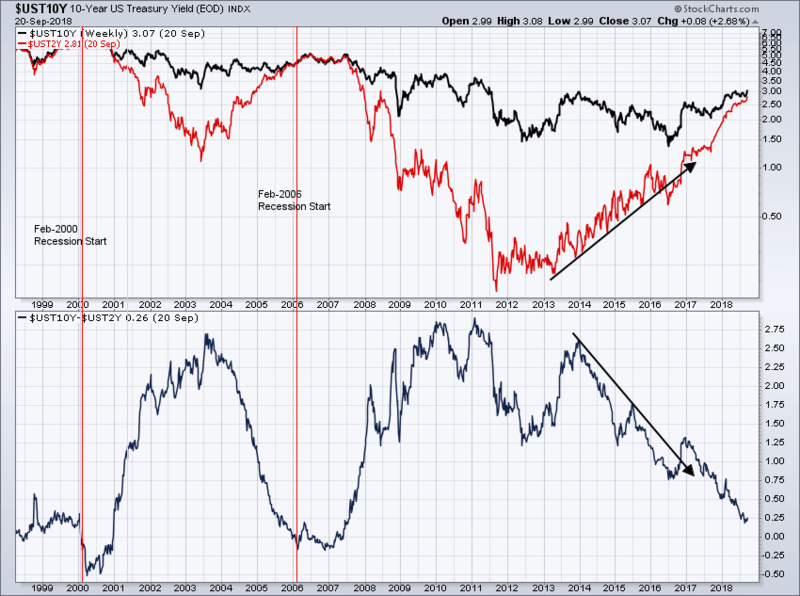 However, since Fed Funds rate have a greater impact on shorter term rates and the Fed is getting more hawkish, it behooves us to keep an eye on this spread as a warning sign. Many FOMC members have indicated that though they consider yield-curve turning negative an important point it alone would not change their stance regarding the rate hike for next few cycle. Tuesday September 25 – Conference Board Consumer Confidence. The market is expecting a reading of 132.2 versus previous month’s reading of 133.4. This is still a very healthy reading and the up trend since 2009 is maintained. September 23, 2018 in Market Commentary.